This axe was collected from Makira in the Solomon Islands by WH Lawrence who worked on the Labour Trade vessels that brought South Sea Islanders to work as indentured labour in Queensland. 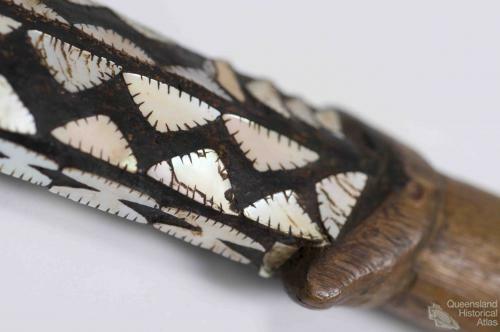 The axe handle with its elaborate shell and wood decorations is distinctive of its Pacific origins. 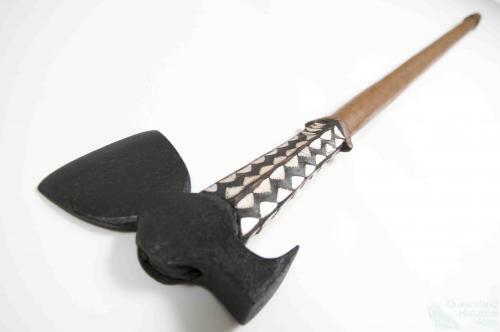 Description: Steel bladed axe collected as part of the labour trade. The upper portion of the wooden haft is inlaid with geometric shaped nautilus shell cutouts set in black parinarium paste.